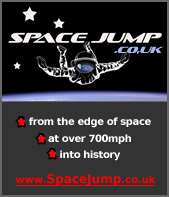 More great press support as we move closer to getting the much needed sponsorship in to enable Steve Truglia and Space Jump to beat the Austrian Red Bull sponsored rivals. Great interview on BBC Radio London on Friday morning with Paul Ross and Gaby Logan, thanks guys. Thanks for all the messages of support and donations, I'm deeply touched. Let's make it a British record! Red Bull have announced an attempt at the Space Jump with one of their 'athletes' at the end of 2010. This is great news because my project can launch THIS SUMMER!!! beating them to it. Everything is firmly in place and ready to go. To make this happen we urgently need sponsorship to get the balloons built, test jump and launch this incredible adventure. The opportunity for PR is now better than ever before as the prospect of a space race between myself and Red Bull wil intensify the publicity surrounding this attempt, please spread the word! The great people at TED have kindly put my talk about stunts and Space Jump online today. All the team at project SpaceJump and Prostunts are mourning the untimely death of one of the World's greatest and most charismatic skydivers Eli Thompson. A veteran of over 10,000 jumps and a Red Bull athlete, Eli was lost whilst training in Switzerland, doing what he loved. He will be missed by the whole skydiving community across the globe. Our sincere condolences go to Eli's wife and family at this sad time. The TED Conference in Oxford July 2009 was absolutely amazing. It was a huge honour to be asked to be a speaker at such an incredible event. Here are a couple of pictures from that talk. Witin the next few weeks the video of the talk will be published on TED's site. Here I'm showing the TED audience the spacesuit that I'll wear on the Space Jump mission to 120,000ft. And here talking about improvements in stunt work due to advances in technology. I am honoured to be doing a talk about the Space Jump project at the highly prestigious TED Conference in Oxford on Tuesday 21st July 2009. The talk will be published on TED's website at some point. The Sunday Telegraph Newspaper asked me to do an article on what takes to be fit enough to do movie stunts. I spent the day with journalist Alex Benady, who was a great sport, he was fit, strong and determined. A true example of someone with a busy full on deskbound career staying in very good shape. Click here to read the article on Telegraph.co.uk's website. Last week was the first opportunity to fly my new Russian custom made spacesuit. It's the only one of it's kind in the World, having been put through it's paces at the American company which makes suits for NASA, (company and manufacturers names witheld until after the jump). Photo courtesy of Aikix. Geeking in on my pic is Andy Godbold, sky god! The next tests will include the life support system and parachute container. Further tests will include flying the drogue chute in the tunnel to test stability. Then it's on to the hypobaric and cold temperature tests. NB: THIS PROJECT URGENTLY NEEDS SPONSORSHIP, please help us break this exciting record which has stood since 1960!